Lately, I’ve been inspired by what I eat lately. I shared about how there’s not much creativity in what I eat earlier this week, but that doesn’t mean that I don’t enjoy the food I’ve been eating. I also that I’m not super comfortable eating in front of other people. My relationship with food is warped, to say the least. Nonetheless, I take great pleasure and enjoyment from the act of eating- compared with the social experience of eating, where I garner almost no pleasure. In an effort to start appreciating the food I eat more, I’ve started a Foodstagram. I would love it if you follow me. It’s still a pretty new thing, but I’ve long been using #foodemilieeats on Instagram for both my personal Instagram and the Burke Does Instagram. And, to my luck, it’s a hashtag that it appears only I am using. I thought that would make the perfect name. On to the point… what did I eat for dinner last night? Well, last night was Friday. I’m secretly in New Jersey- by secretly, I mean, I have a lot of work I had to get done and couldn’t really see a ton of people, so haven’t brought a lot of attention to it. I spent all of last night working, right up until 1130 PM. And then I realized I hadn’t eaten. And that I should probably eat. I went to my mom’s kitchen, looking for food, only to remember that she never grocery shops. Well, into the pantry- cereal or Cup of Noodles. Well, Cup of Noodles it was! Not at all fancy. 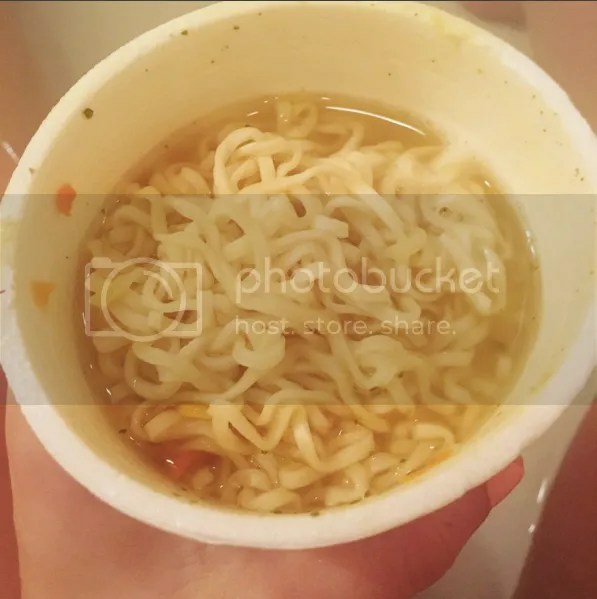 So go check out the exciting picture that I shared on my Foodstagram of my Cup of Noodles! Maybe it’s exciting, but I make no promises. Okay, it’s below, but go see what else I’ve been eating lately!